Mount Tenjo is located on Kozushima one of the volcanic Izu Islands administered by the Tokyo Metropolitan Government. Similar to Hachijo-jima that I visited last year, the island offers stunning scenery, delicious fresh seafood and has plenty to keep your interest for several days. Access to the island is met either by large passenger ship from Takeshiba pier near Hammatsucho Station during the peak season or high-speed jet ferry at other times. There are also three daily flights chartered through New Central Airservice out of Chofu Airport. The large passenger ship departs at 10:00pm arriving at Kozushima 10:00am the following morning. Advanced reservations recommended during school holidays. On route, it makes stops at four other islands. On the return crossing, the ship miraculously cuts the travel time to 8.5 hours. The island has two ports the Maehama Port and Tako Port. Though normally the ship docks at Maehama Port. After disembarking make a beeline for the ferry terminal building where you’ll find an information centre. They have copies of the hiking map included in the link above. I also suggest booking the return trip at the ferry counter if you haven’t already done so. The free camping options aren’t as glitzy as found on Hachijo-jima. At Nagahama Campground you pitch your tent directly on the beach and at Sawajiri Bay Campground you setup on a grassy easement alongside the beach. Given I was going to be staying for a few nights neither of these options particularly appealed. A far better option is to walk one hour or take short taxi ride to the Tako Bay Campground 多幸湾キャンプ場 which provides sheltered sites and is a bargain at 400 yen per person a night. Note that while the hike to Mt Tenjo 天上山 isn’t overly strenuous I wouldn’t recommend tackling it straight after a 12-hour ferry ride. Instead on the first day consider checking out the Matsuyama Walking Path which offers terrific coastal views over Tako Bay. 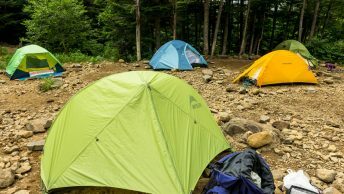 Another point is there is very little in the way of shelter on the mountain which means that during the hotter months you’ll want to be making an early start to avoid sunburn and or heat exhaustion. The trail notes here describe a circuit of the mountain starting and finishing at the Tako Bay Campground. From the campsite find the stairs heading down to Tako Bay. At the bottom of the stairs you should see a sign pointing towards the Hyuga Shrine 日向神社 about 200 metres from the campsite. After reaching the shrine follow the signs for Mt. Tenjo / Kuroshima 天上山黒島遊歩道. From the shrine the trail makes some switchbacks as it gains elevation but basically follows parallel with the road below. The first landmark to look for are two metal tubes. One tube takes aims at a rock formation which apparently bears a resemblance to a Buddhist deity and the other tube allows you to listen to the wind. The trail soon hits a paved road which eventually leads onto the trailhead proper. It should take around 45 minutes to arrive at the trailhead from the campsite. The Kuroshima trail is signposted with a series of 10 合目 evenly spaced markers and takes approximately 40 minutes to reach the upper ridgeline. A full circuit of the mountain top which incorporates both loop trails is 3.8 km, taking around 2 hours to complete. It’s worth making a short detour to the Sendai ike 千代池 though owing to a distinct lack of rainfall it was more of a glorified puddle. Returning to the main trail travels through some lush canopy. A little further along the Kuroshima trail look for a signpost pointing to the Urasabaku desert 裏砂漠 which allows you to shortcut across to signpost no. 5. A nice touch are the numbered signposts which not only correspond to the hiking map but many include paintings done by local school children. Navigating through the desert landscape with scenery more reminiscent of the Japanese Alps is aided by a pathway denoted with rocks either side. This path culminates at view spot where you can see the uninhabited Tadanaejima as well as Miyakejima and Mikurajima on clear days. Continuing in a counter clockwise direction will soon bring you to one of the “new 100 best views of Tokyo” with views afar a field as Izu Oshima. Next point worth stopping by is Fudo ike 不動池 which has a shrine positioned at its centre though this pond again was mostly dried up. From here make a short detour up to Tenku-no-oka 天空の丘 which affords 360 degree views. Sweeping around the back leg of the crater you will pass Babaa ike ババア池 and Hairanai-ga-sawa 不入が沢 before the finally climbing to the summit of Mt. Tenjo 572m. After taking in the views retrace your steps to the main path and head towards Omote Sabaku desert 表砂漠 where there are several rough-hewn tables and chairs. From here it’s basically a matter of repeating your footsteps back to the campsite.